After a disappointing run in FY19, most experts feel that the worst might be over for small and midcaps and investors can start accumulating quality stocks on declines. Down, but not out! That boxing analogy has been true for the broader market in past year. Broader indices underperformed benchmarks by a wide margin. 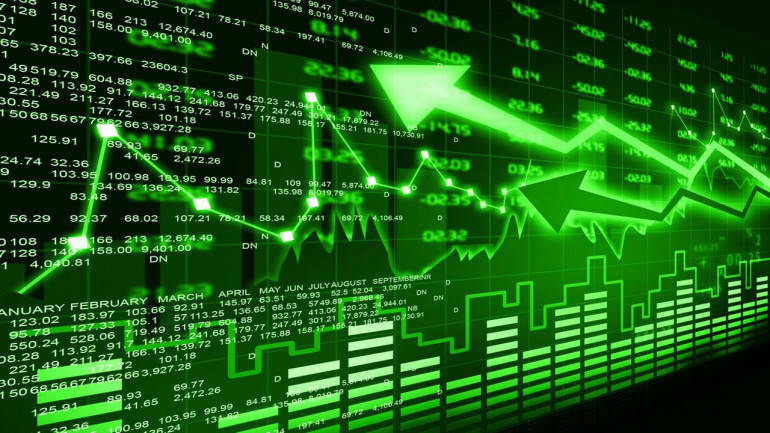 In the financial year 2019, S&P BSE Sensex has risen 15 percent and Nifty has jumped 13 percent as of March 22, 2019. In comparison, S&P BSE Midcap has fallen 5 percent and S&P BSE Smallcap index has dropped 13 percent in the same period. But a handful of smallcap stocks outperformed. 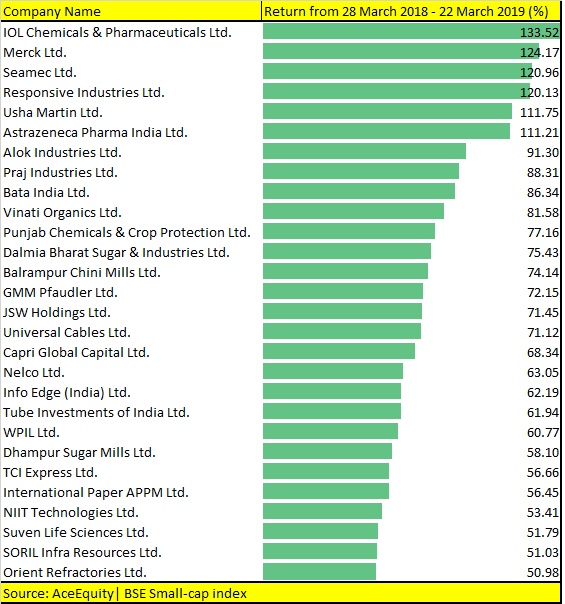 As many as 28 stocks from the Smallcap index gave over 50 percent returns in the past year. And 6 out of 28 gave returns in triple digits. 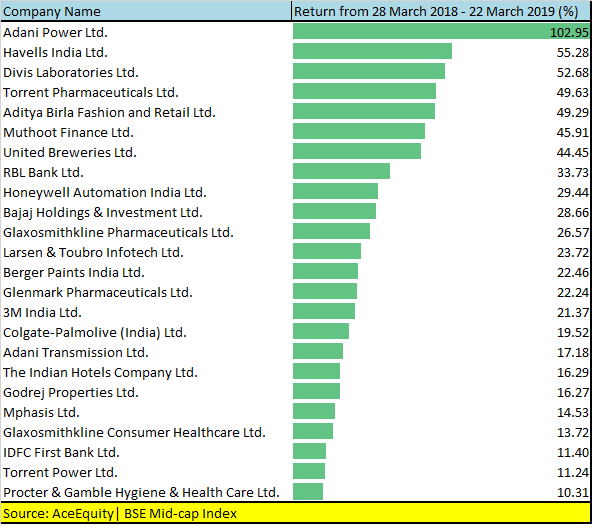 Stocks that gave multibagger returns are IOL Chemicals, Merck, Seamec, Responsive Industries, Usha Martin and Astrazeneca Pharma. In the midcap space, 25 stocks rose 10-100 percent in last one year; out of which, three gave returns of over 50 percent — Adani Power, Havells India and Divi’s Laboratories. Selectively, mid & smallcaps have outperformed but as a theme, they suffered due to many factors. Higher valuations, SEBI reclassification norms, lag seen in earnings growth momentum, and corporate governance issues which surfaced in select stocks marred the attractiveness of the space. Foreign institutional investors were also net sellers of Indian equity in almost 8 out of the last 12 months, Moneycontrol.com data showed. They have pulled out close to Rs 50,000 crore from Indian equity market so far in FY19. Historical analysis of midcaps reveals that (a) there has never been two consecutive years of negative returns; and (b) the positive returns in the year after negative returns have always exceeded the negative returns, Elara Capital said in a report. The relative valuation of midcaps compared to largecaps are at a historically low level, both at an absolute level as well as on a rolling basis, with 7 DMAs at 2014 levels, the report added. With four-year midcap – large cap premium practically wiped out, Elara now believes that valuations are reasonable to support midcap recovery. From the midcap space, Macquarie likes Phoenix Mills, L&T Info, Minda Industries, Jubilant FoodWorks, Ujjivan, Apollo Hospitals, NCC, Crompton Consumer, ACC and Berger Paints. 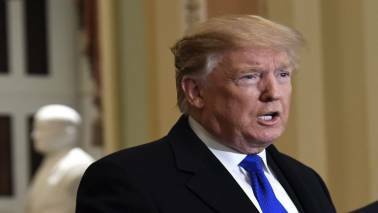 Earlier in March, Morgan Stanley in a report said that it expects Sensex at 42,000 by December 2019. The global brokerage further said the performance gap between largecaps and broader market has started to narrow but has a fair bit of distance to cover, so it expects the broader market to outperform. Morgan Stanley's list of favourite midcaps include Indraprastha Gas, Cyient, Just Dial, Edelweiss, Oberoi Realty, Indian Hotels and Amara Raja Batteries.